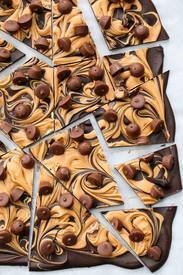 This decadent peanut butter cup chocolate bark would make an amazing last minute holiday gift. With only 3 ingredients (chocolate, peanut butter chips, and mini peanut butter cups) and about 20 minutes of your time, you’ll have shards of gorgeously swirled peanut butter bark to give to anyone and everyone (just don’t forget to save some for yourself!) Even better, make a batch of this and a batch of the fruity version, and you’ll become that gourmet friend with the fancy chocolate. And we all know EVERYONE wants to be friends with that person.